Whenever i watch a documentary on ancient civilizations, it has a profound impact on me. Not because of the legacies left by the-once-mighty empires of the past. But, more so religiously. Our scriptures are filled with verses after verses on how Allah had destroyed the civilizations of the past, due to their stubbornness in committing evil. What these documentaries serve do is, give another stamp of approval to the verses of the Quran, that deal specifically with the civilizations of the past. Adding a tangible reality to the weighty words of God almighty. [Quran 40:21] Have they not traveled in the earth and seen how was the end of those who were before them? Mightier than these were they in strength– and in fortifications in the land, but Allah destroyed them for their sins; and there was not for them any defender against Allah. [Quran 11.82] So when Our decree came to pass, We turned them upside down and rained down upon them stones, of what had been decreed, one after another. [Quran 20.128] Is it not a guidance for them (to know) how many a generation We destroyed before them, amid whose dwellings they walk? Lo! therein verily are signs for men of thought. It adds another layer of understanding to what is being said. Almost a ‘i know what you mean’ effect, that someone who has gone though a tragedy, would say. I am not trying to say that these documentaries add weight to Allah’s words. Or, they prove Allah’s words. Without these types of documentaries, Allah’s words are self-evident in on itself. Programmes such as BBC’s ‘Lost civilizations of the Past’, brings home the message of man’s inapt nature to always to be rebellious to Allah. How, despite knowing the same end awaiting those who rebel. It seems, like the prophet (saw) said, a man’s hunger to fulfill his desire will not end unless he is 6 feet underground, in his grave. In as many people who have walked the earth, there is almost the equal number of ancient civilizations known to have once existed. Yet, majority of the civilizations have ended up the same, in destruction and death. Many of us are familiar with Ad, Thamud and people of Pompeii. How Allah’s warth rained down upon them for a number of days and nights, completely destroying them into oblivion. Even before their times, (Ad, Thamud, Pompeii) there were civilizations, less known, which met similar if not greater, cataclysmic level of destruction. Both written about by muslim and non-muslim historians and philosophers like Aristotle. In a recent BBC programme ‘Atlantis : the evidence’. Bettany Hughes, a historian goes in search of one of these long-lost civilization. More importantly, how it met its end. 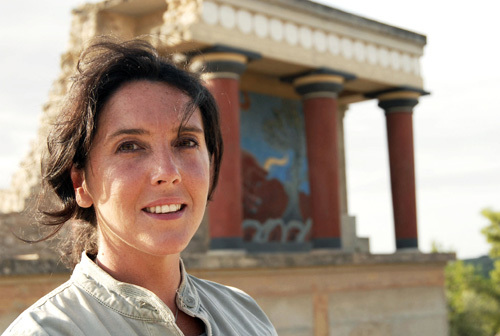 Historian Bettany Hughes examines The Minoan eruption of Thera, which was a major catastrophic volcanic eruption estimated to have occurred in the mid-second millennium BC. The eruption was one of the largest volcanic events on Earth in recorded history. The eruption devastated the island of Thera (also called Santorini), including the Minoan settlement at Akrotiri, as well as communities and agricultural areas on nearby islands and on the coast of Crete. The eruption seems to have inspired certain Greek myths and may have also caused turmoil in Egypt. Additionally, it has been speculated that the Minoan eruption and the destruction of the city at Akrotiri provided the basis for or otherwise inspired Plato’s story of Atlantis. This is a brilliant programme to watch for several reasons. The most important of all, is the religious one. Watching such programmes allows one to travel back in time, to the remote part of the world, once considered to be a mighty and indestructible home of an empire. Only now this ‘mighty and indestructible empire’ has been reduced to nothing! Furthermore, programmes such as ‘Atlantis : the evidence’ allow the audience to experience how the ancient lived their lives; eating, drinking and socializing the same way as we do. Only to end up by crashing headlong into the pages of history, a gruesome end for the most part.